The Puget Sound and Hood Canal spot shrimp fishing season gets underway Saturday (May 6), and anglers can look forward to another decent season. 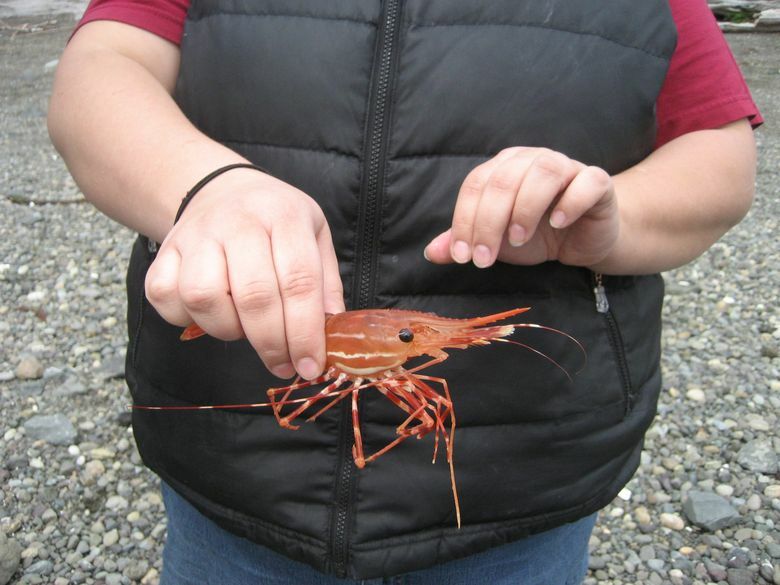 State Fish and Wildlife recently conducted abundance test fishing, and those indicated a healthy population of these deep-dwelling, prawns-sized tasty shrimp. 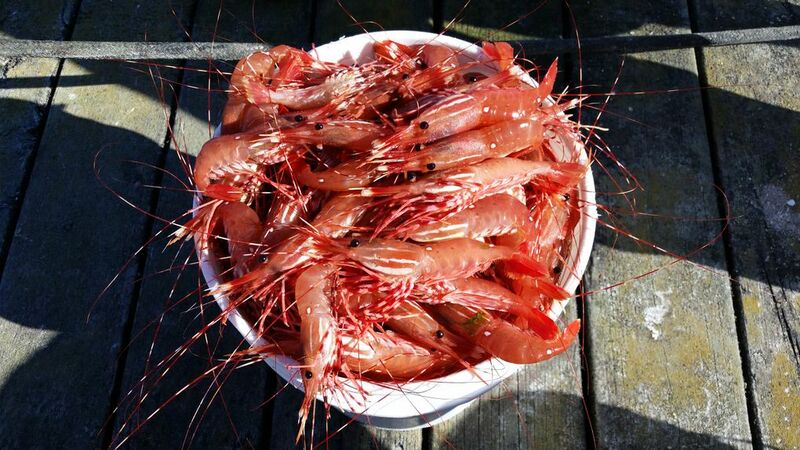 Bucket-loads of shrimp are not uncommon in the San Juan Islands and eastern Strait of Juan de Fuca spot prawn fishery. Be sure to check WDFW regulations before you go. Photo courtesy of Tony Floor. Test fishing showed an average of 7.9 pounds in northern Puget Sound (Marine Catch Area 9); 7.8 pounds in central Puget Sound (10); 7.3 pounds in south-central Puget Sound (11); 7.6 pounds in Hood Canal (12); 3.6 pounds in southern Puget Sound (13); 2.7 pounds in Discovery Bay (part of 6); 5.6 pounds in San Juan Island West; and 5.3 pounds on east side of Whidbey Island (8-1 and 8-2). The total daily average during the four days it was open last year in Hood Canal was about 14.5 pounds of spot shrimp per boat. The opening day produced an average of 15.2 pounds (17.0 in 2015 on the same date, 17.6 in 2014 and 18.0 in 2013). One popular location situated in front of the Seattle skyline is Elliott Bay, and while no test fishing was conducted O’Toole is predicting another banner season. Bainbridge Island in central Puget Sound is another area where anglers seem to concentrate their efforts, and catch average last year was 18.7 pounds per boat (18.8 in 2015 on same date, 17.7 in 2014 and 17.4 in 2013). Shrimp such as these will be up for grabs starting May 6, when the popular shrimp-fishing season kicks off. Sport and non-tribal commercial fishermen split a 300,000-pound spot shrimp catch quota with 70 percent going to the sport fishery. The tribal fishery has a 300,000-pound catch quota. The Strait of Juan de Fuca from Sekiu to Port Angeles (5 and 6) and San Juan Island West (7) are open daily starting Saturday (May 6) and will close once the catch quota is achieved. The Discovery Bay season is open Saturday (May 6), and May 10 and 17 from 7 a.m. to 3 p.m. each day. San Juan Island South and East (7) are open daily from Saturday (May 6) through May 21. The east side of Whidbey Island (8-1 and 8-2) and northern Puget Sound (9) are open Saturday (May 6), and May 6 and 17 from 7 a.m. to 3 p.m. each day. The state and tribes are still in negotiations over specific dates and fishing times for central (10), south-central (11) and southern Puget Sound (13) and Elliott Bay (10). What is guaranteed is that fishing will occur at least on Saturday (May 6) in those four marine areas. Anglers should check the state Fish and Wildlife’s web site at http://wdfw.wa.gov/ for last minute updates. Hood Canal (12) opens Saturday (May 6), and May 10, 17 and 20 from 9 a.m. to 1 p.m. each day. The daily limit is 80 spot shrimp per person.